Friday August 19th 1898 I sewed a little this forenoon and in the afternoon Will and I went to town. I attended a reception at Mrs Will Connors for the W. H. M. S. It was very pleasant. Saturday August 20th 1898 It rained early in the day and at supper time we had another hard rain. I did a lot of baking in the forenoon and was down to Callies in the afternoon. Will went to town in the afternoon with Ed to find out about trains and rates for the excursion the 1st of September. Sunday August 21st 1898 Will and I went up home and it most awful hot. We did not come home till night. While up there we talked up the trip to Ohio. Mary Woolf will not go and there is no doubt that Hatt & Edith will. Monday August 22nd 1898 It was still very hot. we could not do much of any thing. I wrote some letters in the morning and was down to Callies in the afternoon a little while. 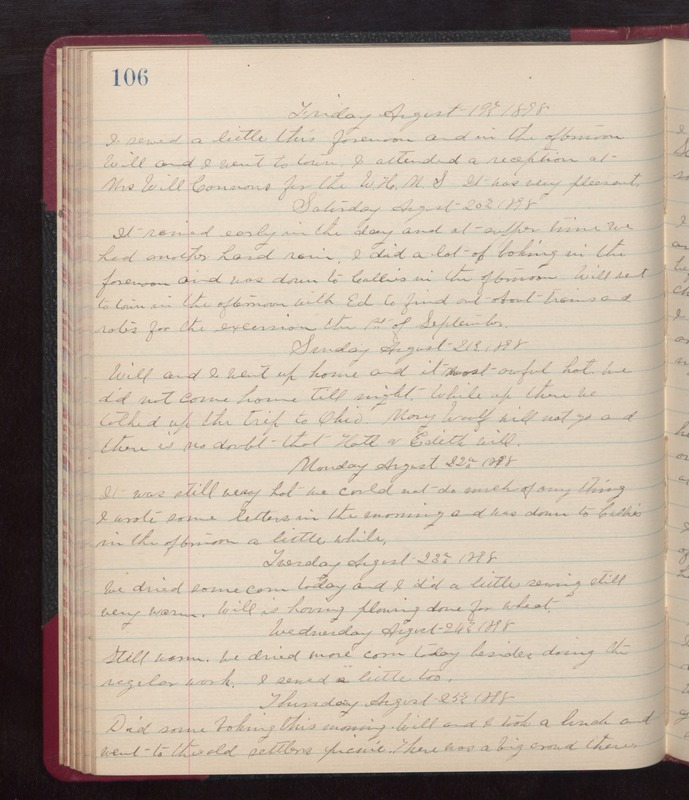 Tuesday August 23rd 1898 We dried some corn today and I did a little sewing still very warm. Will is having plowing done for wheat. Wednesday August 24th 1898 Still warm. We dried more corn today besides doing the regular work. I sewed a little too. Thursday August 25th 1898 Did some baking this morning. Will and I took a lunch and went to the old settlers picnic. There was a big crowd there.